Ok, so I had to drive an hour, but I finally tracked down a copy of this month’s PC Gamer, and boy was it worth the trek. I’ve been reading the magazine for a long time, but this is the first issue my work actually appears in its pages. Back at PAX East I had a fun sit down demo and interview with the folks at Topware Interactive on the upcoming Two Worlds II. I played the original and enjoyed aspects of it. However, the production wasn’t so hot. With a new engine, some slick updates, and a lot of cool new features, the sequel is shaping up to be pretty badass. Check out my preview piece on pages 48 and 49. 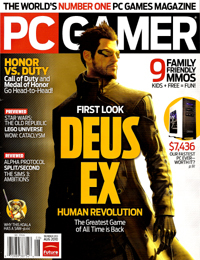 This entry was posted in PC Gamer and tagged Hands-On, magazine, PC gamer, Preview, print, Two Worlds II by nmeunier. Bookmark the permalink.